In 2001 we also, through some remarkable events, made connections with a cell church in Moshi called El Shaddai. Following the death of their pastor and a group of elders in a car accident, the group was co-ordinated by a wonderful, vivacious woman, Mama Grace Gumbo. We have helped support the establishment of a micro-finance revolving fund at El Shaddai; after a false start the project was restored in 2007, now coordinated by Elias Mringa. 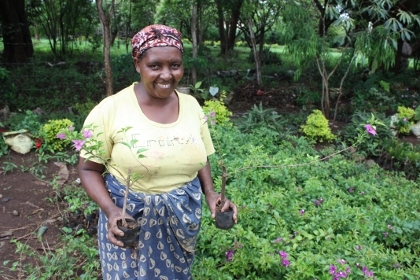 Several initiatives are being supported, such as a tree nursery run by a lady called Antonia. We are continuing to help the establishment of this fund.